• Using high efficiency coreless motor, higher performance superiority, increased output torque, faster reaction time, resulting in higher holding power on swashplate, providing precise control feel. Obviously its high performance is suitable for RC cars and airplanes. 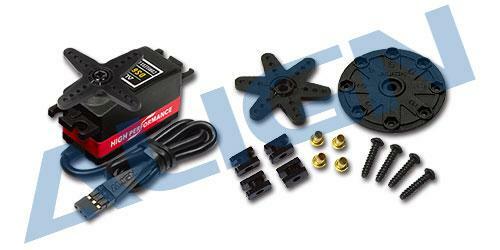 • Silicone-insulated magnet wire, providing a high-end texture and a durable protection for the servo. • Hardened high strength super alloy gears that increase the lifetime. • Aluminum alloy mid case construction for instantaneous heat dissipation, maintaining servos high efficiency. 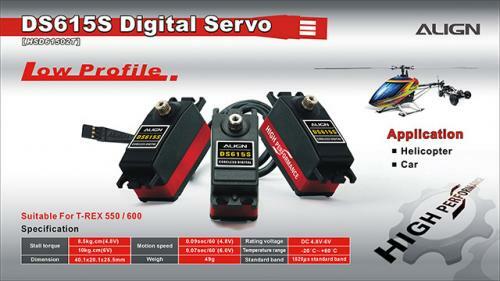 • Powerful and precise servo, suitable for T-REX 550/600 swashplate use, and also suitable for remote control cars, airplanes.